This unique Nativity features the Holy Family being escorted by two boatmen (shepherds) down a river. Mary cradles baby Jesus while Joseph sits near them. This is a serene interpretation of the Holy Family traveling on Life’s rich journey. The second boat contains the three wise men, also escorted by a boatman. Each piece is crafted from light-colored wood and then stained a deep brown. The wood is probably jacaranda. 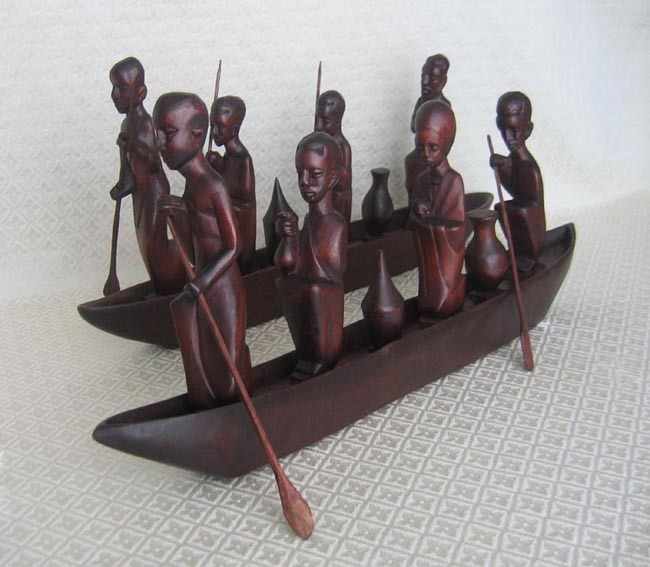 The boats with removable figurines measure approximately 22 inches long by 10 inches tall. This unique set is fair-trade imported from Rwanda. The country of Rwanda is tragically best known in recent years for the 1994 genocide that occurred during the country's civil war. At least 500,000 ethnic Tutsis and thousands of moderate Hutus died in the genocide. Some estimates put the death toll between 800,000 and 1,000,000. This genocide was mostly carried out by two extremist Hutu militia groups, the Interahamwe and the Impuzamugambi. In the immediate aftermath of the genocide, females represented 70% of Rwanda’s population since so many men had been killed. Women must play a significant role in Rwanda’s rebuilding and democratic transition. Previously excluded from positions of influence, women now participate as elected officials, community leaders, and entrepreneurs. Most importantly, women provide the sole source of income in many families due to the loss of so many men.